Forex and binary broker Grand Capital offers one of the largest bonus among existing on the market – $500 on the trading account. Broker has been providing financial, educational and brokerage services more than 12 years since 2006. I should say you that this Grand Capital no deposit bonus could not be withdrawn. You may withdraw only the profit after fulfilling all the conditions of the broker. So, follow further instructions to know how to get one of the biggest no deposit bonus at forex market. Here you will see links for confirming your phone number and passing document verification. Click on the first link. You will get to the security settings section where you may change the OTP-binding. It can be done in two ways: enter your phone number and receive SMS or download a special application (available for IOS, Android and Windows, 7/8). Then, go to the next section – “Documents”. Here you may pass the verification of your identity. 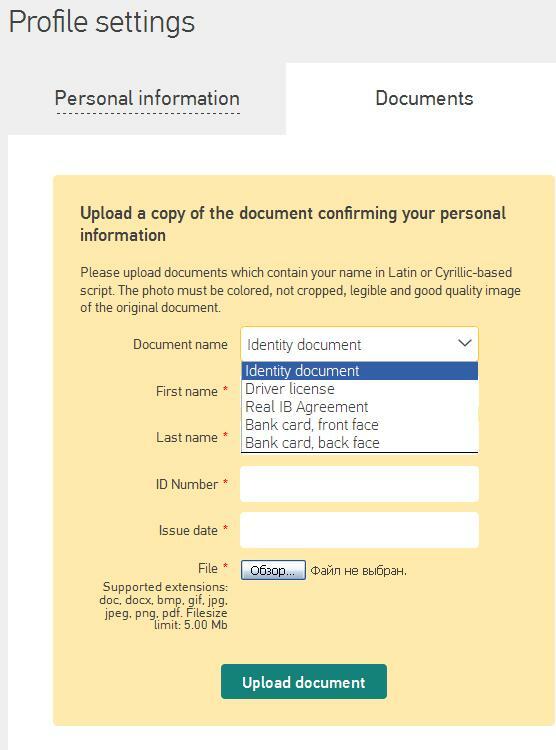 Choose which id document you prefer to upload (identity documents, driver license, bank card with two sides) and fill in other fields. Make sure that file size is not too large and file format will be readable by the broker’s system. When the verification procedure will be completed, the special button “Get the bonus” appears in the “Bonus” section. 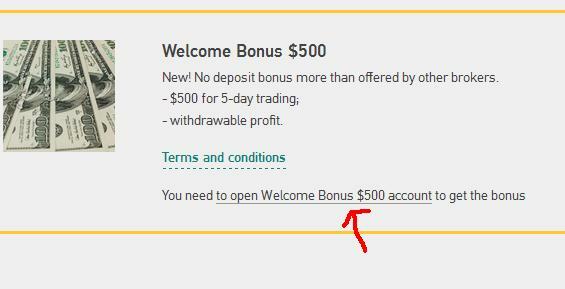 You should click on it to open a special account “Welcome Bonus of $500″. This bonus account will be credited 500 dollars which can be used for trading during nearest seven days. 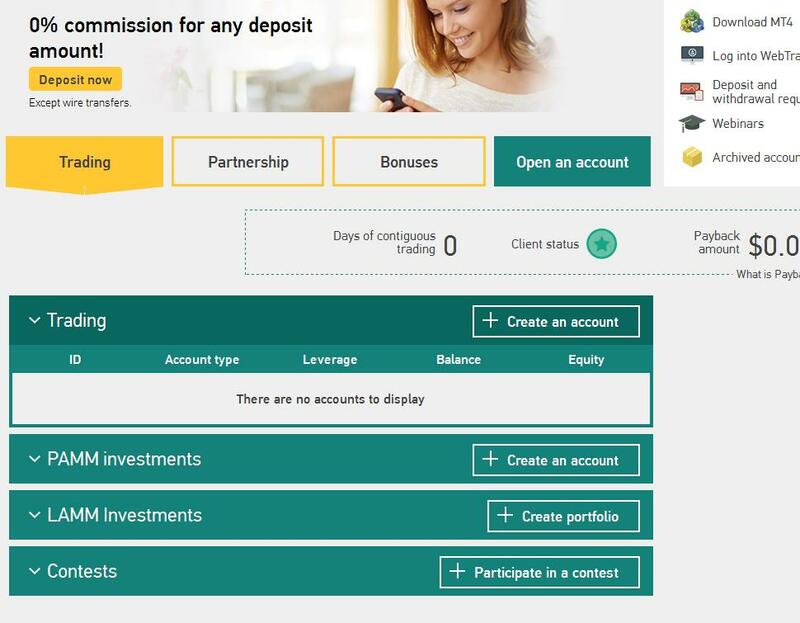 How to withdraw no deposit bonus of Grand Capital? After opening the bonus account you have only seven days to trade on it. Funding the Grand capital welcome bonus account and withdrawals from it are impossible. Trading conditions are similar to Standard account (about conditions for trading account – below), but the leverage can’t exceed 1:100. After 7 days USD500 will be deducted from the account balance. Only trading profit will stay at account balance. 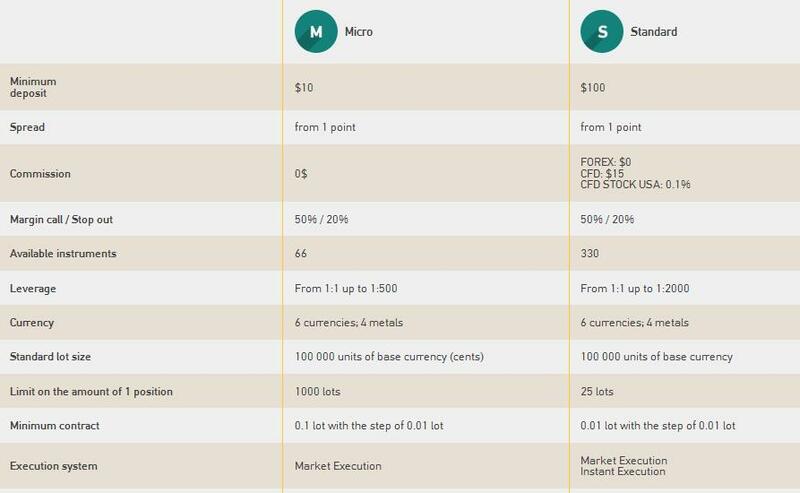 Bonus account type will change to the Micro, if bonus profit will be less than $100. Bonus account type will change to the Standard, if your bonus profit will be more than $100. For further work it is necessary to activate a new account. 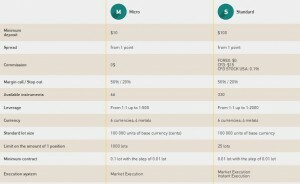 For activating you need to make deposit on amount equal to or bigger than your trading profit (but deposit amount has to be not less than $10 for the Micro accounts and not less than $100 for the Standard accounts). Without such activation (via deposit) all bonus profit will be charged off from your balance in seven days. Withdrawal will be available only after completing certain amount of trading operations on the Micro or Standard real account: for every $5 of your profit made on bonus account, you must trade 1 lot for Standard account or 100 lots for Micro account. After completing of the trading condition you should submit a request for converting your bonus profit into your own funds. To do this in Grand capital private office, login your account, then select “Support” – “Create a ticket” or simply send your request to the company’s e-mail. Write in message subject: “$ 500 – no deposit bonus – the transfer of the ownership of a bonus”. Do not forget to write your trading account number and your name. Support will review your application, check the possibility of fraud and approve your request, if everything is ok.
You are prohibited to trade through proxy servers. How to withdraw and deposit funds? To deposit funds or to request withdrawal from your account at Grand Capital you may use next payment ways: VISA, Visa Electron, MasterCard, Maestro, Bitcoin, Ethereum, FasaPay, Neteller, Skrill, Payeer, Perfect Money, Webmoney, Sentraegold. At Grnad capital you may use for trading MetaTrader 5(MT5), MetaTrader 4(MT4) and WebTrader (terminal for in-browser online trading). Grand Capital has different financial tools for trading and investment. You may use in your trade biggest cryptoсurrency(18 cryptocurrency pairs), ECN Prime(quotes from the leading market-makers Bank of America, Deutcshe Bank, BNP Paribas, Societe Generale), Binary options, CFD(stocks, indices, commodities, currency pairs), futures contracts. For investment you may use LAMM accounts(improved version of PAMM accounts. The main difference between LAMM and PAMM is a way of profit allocation and risk management capabilities). Write a comment to "Grand capital no deposit bonus $500"